Saarland became a Bundesland, or Federal State, of the Federal Republic of Germany on January 1, 1957. As the economy of the new Bundesland was currently based on the French Franc, the new state required its own postage stamps, denominated in Francs and Centiemes. 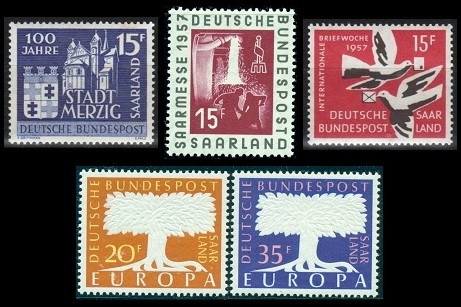 With the exception of the annual International Fair issue, almost all their stamps were identical in design to those same issues of the Federal Republic of Germany. 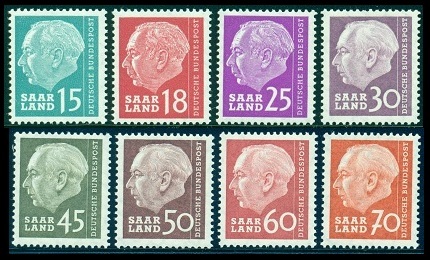 The only difference was the addition of "SAAR / LAND" to the "BUNDESREPUBLIK DEUTSCHLAND" inscription and the denomination of the stamps. 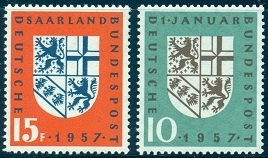 As with the stamp issues of the Federal Republic, all of the stamps of the Bundesland are watermarked multiple DBP and crosses. The 15 Fr. stamp shown above, at the left (Mi. #379, Sc. #262), was issued on January 1 to celebrate the return of the Saar to Germany. On the right is the 10 Pf. West German stamp issued on January 2 for the same celebration, with the only difference being in the color, legend and denomination of the stamp design. 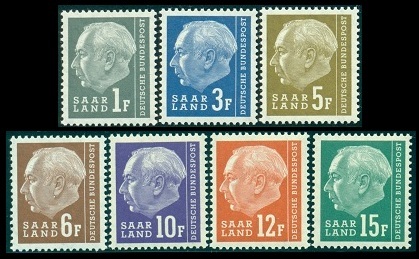 The stamps feature the Saar coat of arms. The twenty definitive postage stamps shown above (Mi. #380-99, Sc. #263-82) were issued between January and May 1957. 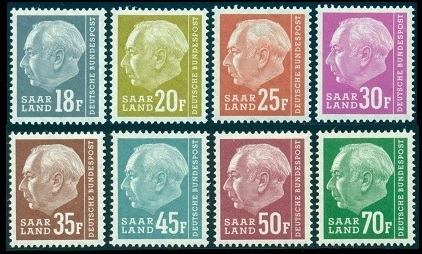 The stamps feature the portrait of President Theodor Heuss of the Federal Republic of Germany, and they are similar to the West German definitive postage stamps issued beginning in 1954, with the exception of the denomination in Francs and the addition of the legend "SAAR / LAND" to the design. Unlike the same issues of the Federal Republic of Germany though, these definitive stamps were not issued in coils or in booklets. The 1 Fr. through the 25 Fr. denominations are typographed, and the 30 Fr. through the 200 Fr. denominations are engraved. 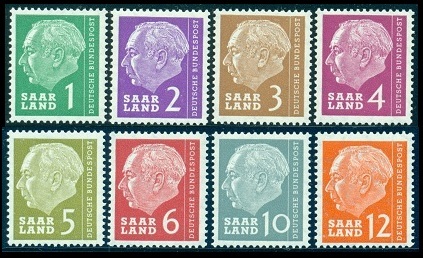 Shown above are the six postal commemorative stamps issued for Saarland Bundesland during 1957. The stamp in the center of the top row (Mi. #400, Sc. #284) was issued April 20 to publicize the 1957 International Saar Fair held in Saarbrücken. 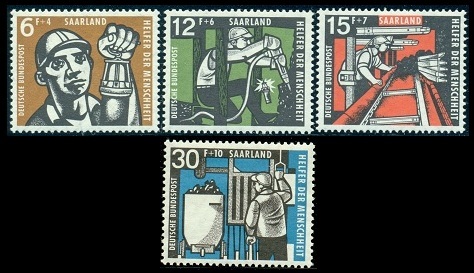 The stamp depicts the theme of the steel industry, the Saar's most important resource. The stamp at the top left (Mi. #401, Sc. #285) was issued on May 25 to celebrate the 100th Anniversary of the town of Merzig. The design features St. Peter's Church and the arms of Merzig. The stamp at the top right (Mi. #408, Sc. #288) was issued on October 5 to celebrate International Letter Writing Week. The design features two carrier pigeons with letters. The two stamps above at the bottom (Mi. #402-03, Sc. #286-87) were issued on September 16 for the annual celebration of the European Union (EUROPA). The design features a tree in full bloom and symbolizes a united Europe for peace and prosperity. The 1957 charity stamp issue shown above (Mi. #404-07, Sc. #B117-20) was issued on October 1. The theme of the four stamps is coal mining. The surtax went to finance a youth study trip to Berlin. The designs feature: a miner, a miner with a drill, a miner and conveyor, and a miner and coal elevator. 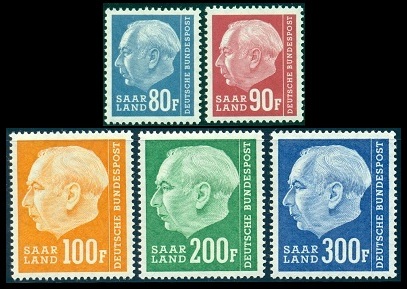 Between November and December 1957, the Saarland Theodor Heuss definitives were re-designed and re-issued, as shown above (Mi. #409-28, Sc. #289-308). The colors are different and the denominations now have the letter "F" for Franc after them. The 1 Fr. through the 90 Fr. denominations are lithographed, and the 100 Fr. through the 300 Fr. denominations are engraved.